After riding out some more storms with heavy rain and thunder, anchored at Burnett Head, Port Bundaberg, we finally got going again on April 16. We had the ambitious plan to be in Darwin within one month. The distance is roughly 2,000 nautical miles which wouldn't be too much on an ocean passage. In this case we would, however, be sailing inside the Great Barrier Reef and apart from that, the deciding factor would obviously be the weather conditions. 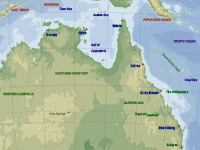 On the map above, which we made before departure from Bundaberg, we have indicated some spots where we would likely be making landfalls during this voyage. 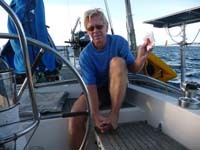 The first two weeks we had almost no wind, and were forced to motor sail. If we could have sailed we would have done some overnighters, but I didn't want to run the engine for more than 12 hours at a time. Because of our time limit we ended up doing a couple of overnighters anyway, running the engine for 36 hours each time. 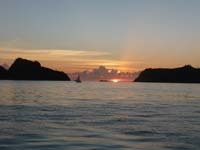 But our normal day routine was to get out of bed around 4 o'clock in the morning and weigh anchor in the dark (sunrise was around 6 am). At the end of the day, sometimes after dark (sunset around 6 pm), we dropped the anchor in the next anchorage 50-60 nautical miles to the north. 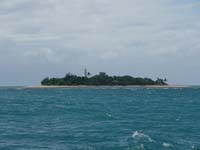 On the second day we reached Cape Capricorn, so named because it lies almost exactly on the Tropic of Capricorn (23°30' S), which is the sun's southern limit of declination. Technically we were now back in the Tropics! 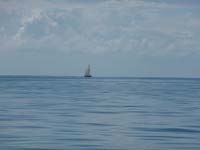 We saw very little traffic, only one or two cruising boats a day who, like we, were heading for Darwin, but at a much more sensible pace - they all have one or even two months more time to get there then we do. click for larger detail of the most dangerous. The dingy is finally afloat! 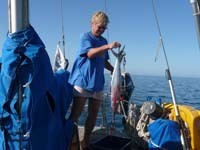 We didn't go ashore at all until Airlie Beach in the Whitsundays, where we did some grocery shopping. 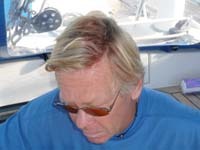 While we were shopping the shoreline ebbed to seaward several hundred metres and we had a hard struggle getting the dinghy afloat again pulling it over drying mud banks and painfully aware of the risk of deadly jelly fish. The warning sign on the beach made it clear that if you are stung by Box Jelly Fish or Irkundij, you need to quickly dial 000 for ambulance to survive! 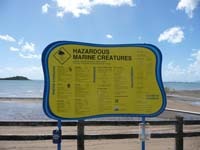 Although the Whitsundays is a major tourist area, people don't swim in the sea, at least not at Airlie Beach. Instead they have built salt water swimming pools on the shores. Second from left has been broken several times! The doctor was not needed aboard Scorpio, neither as a result of encounters with dangerous marine life, nor because of other incidents. I have fractured the second toe from the outside on both feet numerous times, which is easily verified by looking at the deformation. One day I hit the toe again and only 20 minutes later I hit the main boom with my head - luckily it wasn't the other way around, boom hitting head. I was literally covered with blood from top to toe. 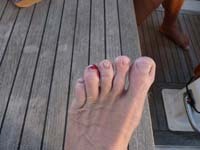 Although minor wounds, it was a reminder, that out on the seas the doctors are far and between. Around a 100 miles north of Cairns is Cooktown, where Captain Cook careened his ship Endeavour after nearly wrecking it on the reef that now bears it's name. 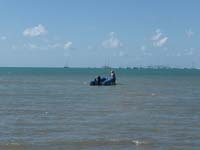 Cooktown is the last town on the east coast, almost 400 nautical miles south of Cape York. The weather pattern changed dramatically when we departed from Cairns, where we had stopped for the last provisioning on the east coast. Typically it went from one extreme to the other, from calms to force 8! The photo above (far right) is of the last other yacht we saw, Southern Mist II, who remained at Lizard Island when we departed from there on our (then) record long day-hop to Flinders Island. 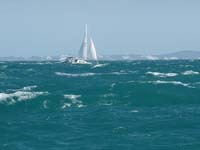 We logged 84 nautical miles in 12 hours, helped by sustained winds in excess of 30 knots and gusts to 51.8 knots. The weather forecast that morning was for 20-25! And although we were on the inside of the Great Barrier Reef the swell was surprisingly high. 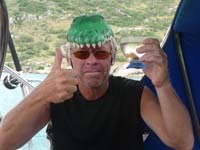 After Flinders Island the people at The Bureau of Metheorology had woken up and the weather was further upgraded to 30 knots and strong wind warnings were issued every day during the reminding 250 nautical miles of our voyage on the east coast of Australia. Two days with particularly dark skies and uncomfortable rain we chose to stay at anchor behind tiny reef islets, although we felt that we were running out of time - but enough is enough, and isn't this supposed to be fun anyway? 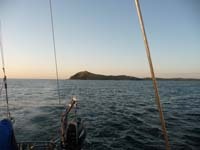 On May 9th, after a new day-hop record of 90 nautical miles, we finally rounded Cape York and dropped the hook in it's lee, 1,160 nautical miles from Bundaberg. Technically, we have now left the Pacific Ocean behind us. 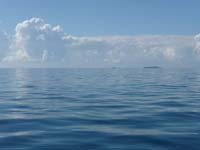 We entered the Pacific through the Panama Canal almost four years ago, in the beginning of May 2005, and we only stayed south of the Equator (except the leg from Panama to Ecuador) - it certainly is a large ocean. We are still in a hurry to get to Darwin, but from Cape York on we will advance much faster and should be able to cover between 120 and 150 nautical miles per day (24 hours) on the open ocean, across the Gulf of Carpentaria and past Aboriginal Arnhemland - some 700 miles to go, see map on the left. 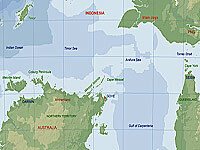 The plan is to depart from the village of Seisia on May 12 and cover the distance in 2-3 legs, skipping Gove and going outside of Cape Wessel, perhaps with stops at Wessel Islands and the Coburg Peninsula. We hope to be in Darwin by the 20th of May. This report was posted in the morning of May 12, 2009, in Seisia.